Thank you for taking a moment to check us out. Below you can learn more about us, how to join, and also where to find our server rules. We hope you have had a fun time gaming with LOoL. If you are visiting our page over an issue, such as being banned or kicked, please Contact Us so that we may address the issue. 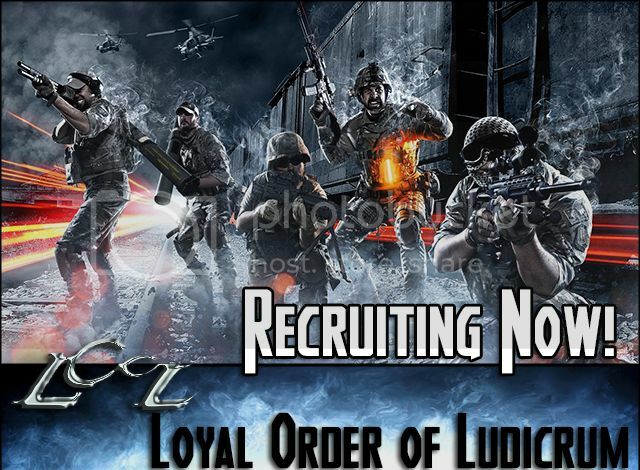 The Loyal Order of Ludicrum (LOoL) was created in 2009 with the goal in mind to bring together like-minded first person shooter gamers from around the globe and multiple game types. It is LOoL’s mission to provide them a Home Base (Website/Voice Comms) where they can share their backgrounds, experience, interests, teamwork, tactical gameplay, we well as providing an environment that allows a “friends-first” experience in an online community. Over the years we have forged friendships and have become like a family. Joining LOoL is joining a family. We take care of each other whether it be helping choose new components to your PC, or sending you a "Get Well Soon" basket if you fall ill.
We are a Loyal Order of Gamers and we hold those traits associated with loyalty in high regard. We like to have fun, goof off, and we hold our server rules dear to us as they were one of the factors that helped create LOoL. LOoL's goal of bringing like-minded individuals together in FPS games was in-part created because of the unique play-style that LOoL embraces. An "as-close-to-how-it-would-actually-be" tactical game-play style. So, instead of Run and Gun, we aim to move tactically (walking) and behave as if we were really there on the battlefield. Our server rules help to create that atmosphere. We invite you to give it a try, you never know - it may be something to add to your repertoire of game play. One of the many perks of joining LOoL Tactical Gaming clan is the opportunity to be involved in private scrims with other clans, meet new people, and feel like you are in a community that understands you. We occasionally fire up older games, such as Battlefield 3, Call of Duty, etc. We also encourage all members to play other games together, share their new game interests, and just have a good time gaming with friends. Many of our members play other games, such as Fall Out 4, Battlefield 1, ARK, Rust, Diablo III, ARMA 3, Ghost Recon Wildlands, and more. Be active on Discord. Being in Discord during gameplay is required. Download Discord. Have a general interest in the clan and its members. Join us in game, and on Discord for at least 30 days prior to submitting your application so we can get to know you. We are a social clan, we expect you to be social. Once you submit your application, there will be a clan vote lasting 7 days. If you are a significant other, family member, or child of a current LOoL member, then membership in LOoL is extended as a courtesy. Once the above requirements are met, feel free to submit an application. Total Rise of the Tomb Raider gameplay hours and Street Fighter 5's new character reveal. Plus, new special edition Xbox One bundle and pre-order program for Deus Ex: Mankind Divided gets cancelled. Microsoft has let an internal studio go indie -- and everyone wins.